Hello lovely readers, I'm so excited for September! In my opinion as soon as September starts so does Autumn and like most of the blogging world I am OBSESSED with autumn. So today I'm going to be sharing with you my goals for the coming month. But first let's see how well I did with my August Goals..
1. Reach 1000 followers on Twitter- Done! I'm so grateful for all of you. I will do a giveaway at the end of September/beginning of October. If you don't follow me on Twitter you can here. 2. Listen to live music- I did this one fairly early in August. My friends and I went to see a band play at Club Burrito and it was such a lovely, chilled evening. 3. Read 3 Books- I'm so pleased I managed to do this one. I read all three books by Banana Yoshimoto that I bought and I loved them all so much. 4. Go on a date with Dan- Dan and I headed to the arcades in August and went to get coffee together and it was such a lovely, fun date. 5. Draw more- I've actually been sketching a lot more recently and it's really been helping me when my anxiety has been bad. So I did really well with my August Goals, let's hope that I can do as well with my goals for September. 1. Read all my pre-reading for my MA. 2. Paint and redecorate my bedroom. 3. Eat more fruit and vegetables . 4. Organise my makeup and throw out empty products. 5. Start saving money for Christmas. I hope you enjoyed reading my goals for September. Do you share any of these goals? 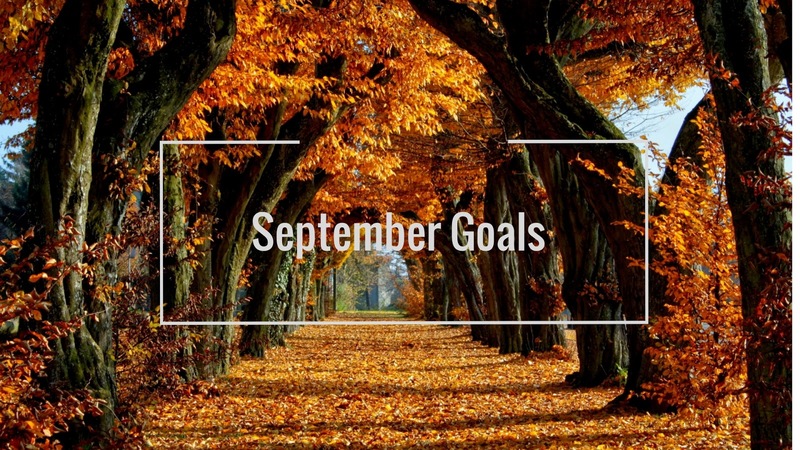 What are your September Goals? Thank you so much, fingers crossed! Thanks for popping in! Awesome work with hit your goals for August! And congrats on 1000 Twitter followers :D One of my goals for September is to redecorate my room too! I should probably start saving money for Christmas too. Great post! Aw thank you, I hope you manage to redecorate your room! Thanks for stopping by! Aw thanks Kim good luck if you have any goals for this month! I hope you are well my gorgeous friend! Oh wow that sounds amazing, good luck with your language school! Thanks for popping by!